ESCAPE From Corporate America! : We Bike Hard For The Money! We Bike Hard For The Money! Great little article on Rebecca Herwick, President of Global Products (who I know and became acquainted with after moderating a global business discussion where she was as a panelist)! 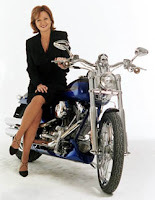 "I've always been a biker girl," says Rebecca Herwick, who is one of the few certified women business owners with an official license to manufacture and distribute Harley-Davidson novelties, giftware and headwear to dealers worldwide. Read more about her success story here.